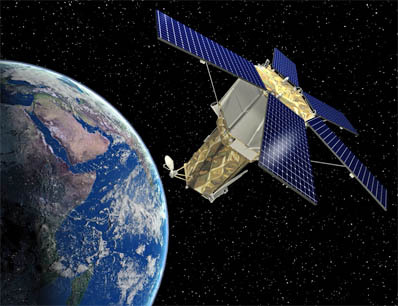 The company's Commercial Launch Services marketing arm has arranged a deal to boost the GeoEye 2 spacecraft to orbit in late 2012 from Vandenberg Air Force Base, Calif.
"We appreciate GeoEye's recognition of the overall value of the Atlas launch services solution. Our commitment to the accuracy and timeliness of the delivery and our dedication to the criticality of the mission match the needs and expectations of GeoEye and its customers," said Jack Zivic, general manager of Lockheed Martin Commercial Launch Services. The Atlas 5 has carried out nine commercial missions since 2002 and this new launch is the only non-government one currently in the rocket's backlog. The Dulles, Virginia-based GeoEye, Inc. earlier this year picked Lockheed Martin to build the high-resolution GeoEye 2 satellite for users ranging from U.S. national security analysts to civilian buyers around the globe. "We chose Lockheed Martin to build and now launch GeoEye 2 because of its 50-year heritage in designing, manufacturing and launching payloads into the perfect orbit," said Bill Schuster, GeoEye's chief operating officer. Plans call for GeoEye 2 to be checked out and operational in early 2013. Officials say it will provide the highest resolution and most accurate color pictures of any commercial Earth-imaging satellite. From its orbital perch of 405 miles high, the satellite's camera will produce a remarkable resolution to see objects on the Earth's surface of 13 inches (0.33 meters). The National Geospatial-Intelligence Agency recently gave GeoEye a 10-year, $3.8 billion contract to provide sharp-eyed imagery to the U.S. government for intelligence-gathering, military planning and natural disaster response. Part of the arrangement includes $337 million to share the development and launch costs of GeoEye 2 and plans for approximately $184 million per year in imagery purchases from the satellite over seven years starting in 2013. Designers of the next-generation craft expect it will collect a greater volume of higher resolution imagery than the previous GeoEye 1 satellite that's currently in service. A Delta 2 rocket deployed GeoEye 1 from Vandenberg in September 2008. Although the venerable launcher has five unsold vehicles in inventory, those remaining rockets have larger solid motors meant for a Delta 2-Heavy that can't launch from Vandenberg's existing pad. "GeoEye 2 will be the same class of satellite as GeoEye 1 but will benefit from significant improvements in capabilities to better serve our customers' demands for increased quantities of imagery at higher resolution. Some of these improvements include enhanced tasking capabilities and the ability to collect more imagery at a faster rate," Schuster said in March. United Launch Alliance will manufacture the Atlas vehicle and conduct the flight for Lockheed Martin. 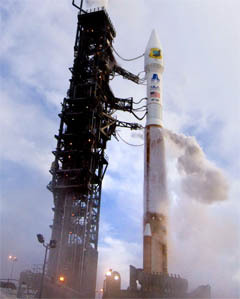 ULA was formed between Lockheed and Boeing in 2006 to marry the Atlas and Delta rocket programs, but the parent companies retain the commercial marketing rights. A 401-configuration of the Atlas 5 will be used for the GeoEye 2 mission to reach a Sun-synchronous orbit covering the planet from pole to pole. This most-basic version of the rocket includes the kerosene-fueled first stage that won't have any strap-on solid motors and a Centaur upper stage equipped with a single cryogenic engine. With GeoEye 2 weighing 4,600 pounds at launch, there is extra room aboard the Atlas rocket for a co-passenger. Lockheed Martin says it is looking for another payload to share the ride. "The Atlas offers significant lift capability to this type of orbit," Zivic said. "We are currently soliciting interest from other satellite operators who need to place their satellites in a similar orbit."